Nothing compares to spending an entire week immersed in creative projects at a Valley Art Center art camp. Your child will thrive in an environment where all skill levels are welcome and every camper will learn at just the right pace. VAC's dedicated and enthusiastic instructors guide young artists to bring ideas to life through textiles, ceramics, cartooning, photography, jewelry and more. Camps are available in sessions of five consecutive half-days. 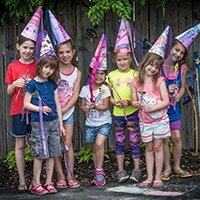 Whatever camp your child chooses, you can trust that your young artist will explore and learn while meeting new friends and engaging in creative play.